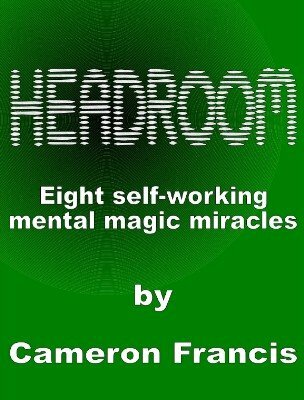 Eight self-working mental magic miracles using playing cards and business cards! A ROUGH YEAR, TOO -- A stunning diary effect. OUT OF TOWNERS -- A prediction and mind reading effect involving an imaginary journey. SUBLIME ROYALE -- One of the most organic card revelations ever. THE BEST -- An ultra clean double prediction effect of a name and a card. ON THE TABLE -- An impromptu miracle. A card placed on the table before the trick starts turns out to be a freely named card. COAT -- A great prediction effect using business cards that you can carry with you everywhere you go. SUPER EASY CAAN -- Sure to be the most talked about trick in the booklet. The hit of Cameron's 2010 lecture tour. Any card. Any number. Totally impromptu. You don't know the card. You don't know the number. The spectator does the dealing. Sound good? Well it is. EITHER OR -- A card and number prediction that's almost completely hands off. 1st edition 2011; 31 pages.